The problem was that time listed for the conflicting meeting was an hour before her meeting. What she failed to notice is the text I have highlighted. She is in the GMT-04:00 timezone and assumed the times on the notification were also in GMT-04:00 when the notifications are actually in the timezone specified on the regional settings of the mailbox. You may want to change the timezone on resource mailboxes to match the timezone of the majority of users who use those resource mailboxes. I’m going to explain how you can do that. Set-MailboxRegionalConfiguration -identity user@domain.com -TimeZone "Eastern Standard Time"
If you are running Exchange 2007, the Set-MailboxRegionalConfiguration cmdlet unfortunately does not exist. To change the timezone on an Exchange 2007 resource mailbox, you need to open that mailbox in Outlook and go to Options – Calendar – Timezone. The timezone listed here is the timezone that is set on the local PC. You can set a timezone for the resource mailbox by choose a different timezone from the drop-down. If the timezone you want to set on the resource mailbox is the same as the timezone currently set on your PC, you will need to change the timezone in Outlook to something else, then change it back. After you select the new timezone, click OK and exit Outlook. You will notice that the timezone on your PC has changed to the timezone you set in Outlook. After you have exited Outlook, you can change your PC’s timezone back to what it was through Control Panel. Note this is not the same as setting the regional setting in OWA. 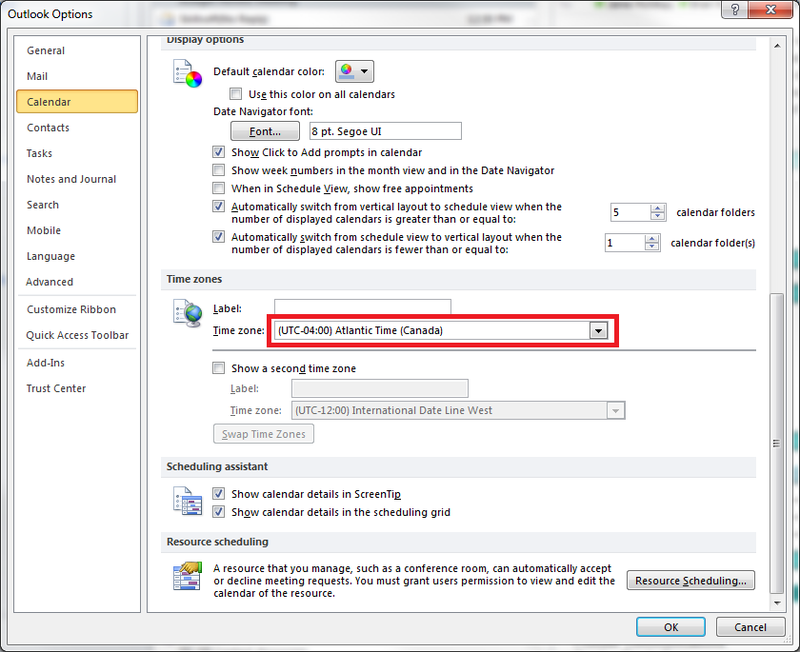 Changing the regional setting in OWA will not change the timezone on the Calendar. You need to do this through Outlook as there is no equivalent setting in OWA.